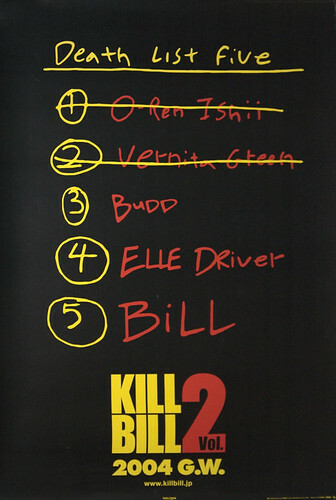 Kill Bill 2 Death List B1 size Japanese movie poster, originally uploaded by japanese-movie-posters. This poster is right up there with the rarest of Kill Bill posters. From KB 2, this is the Death List obviously, and I only know of two other copies. Printed on matte paper and in the B1 size (~29″ x 40″). Available from posterdemic.com for $1,750 shipped. Kill Bill 2 Pink Elle B1 size Japanese movie poster, originally uploaded by japanese-movie-posters.